Description: The Physical map of New Hampshire showing major geographical features such as rivers, lakes, topography and land formations. 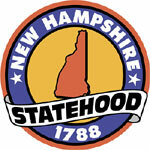 New Hampshire is the 5th smallest state in the country of the United States of America. It covers an area of 24216 square kilometers. The state lies near the northeastern edge of the country. It falls between north latitude 45.18 degrees and west longitude 72 degrees. The state is about 70 miles wide and 190 miles long. The west border of the state is partially taken up by the Atlantic Ocean. The highest point in the state is known as Mount Washington which lies 6288 feet above sea level. The lowest point in the state lies at mean sea level on the Atlantic Ocean. The main rivers watering the state are the Connecticut, Merrimack, Saco, Pemigewasset and Androscoggin rivers. The main lakes are Newfound, Squam and Winnepesaukee lakes. The ecological regions are divided in to the Coastal lowlands, Eastern New England Uplands and White Mountains. The coastal lowlands are an area that begin near the coast with the Atlantic Ocean with white sandy beaches and stretch inland. The eastern New England uplands are characterized by valleys, lakes, rivers and hills. It lies to the west of the state and takes up the most space. The White Mountains is the area with the most elevation up north. Counties and Road map and map image of New Hampshire.